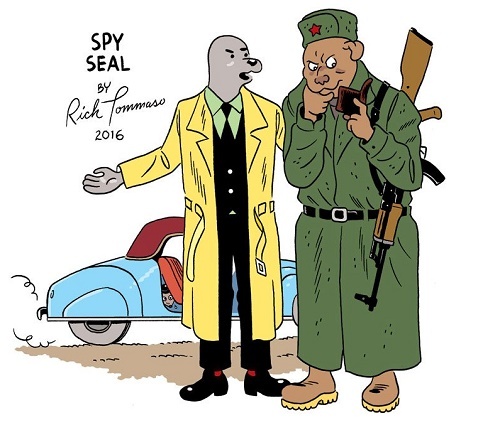 The new comic series of Spy Seal, created by Rich Tommaso (Dark Corridor, She Wolf), plunges readers into the exciting and dangerous world of international espionage. There are times when the spy the world needs is a seal. The world created by Tommaso is filled with all manner and species of spies, saboteurs, snipers, assassins, and double agents. Spy Seal must exceed them all to find out exactly what politically sensitive information lies within the mysterious Corten Steel Phoenix that all of Europe is dying to get their hands on. The concept of the series began after Rich Tommaso published a drawing of the character Spy Seal on Facebook, which generated huge fan interest. Tommaso had first designed the character back in the 1980s but he never expected it to turn into this phenomenon. Spy Seal will be published by Image Comics in 2017.